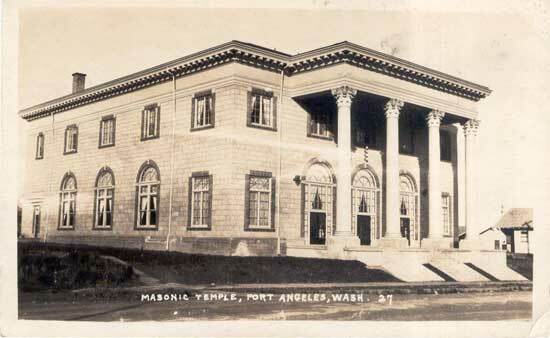 The first Masonic lodge in Port Angeles was established the same year that the city was incorporated. Port Angeles Lodge No. 69 was granted a dispensation to operate on March 27, 1890, and duly constituted by the Grand Lodge of Washington on June 11, 1891. The Charter (original) Members of the Lodge were: Cyrus M. Armbrust, William Banks, Erasmus S. Derickson, William W. Gray, Anthony M. Howells, Stephen Land, John M. Martin, Thomas J. Patterson, Thomas Perry, Daniel P. Quinn, Lathan D. Stewart, Charles Tillman, Henry Westphall, Philo W. Gallup, Henry Salinger, Louis Rockman, William R. Hoole, Willard Brumfield, Anson L. Bustler, Wallace Mynatt, John Gordon, John Hitch, John L. Bell, Joseph Ristine, Stephen P. Raymond, and Fitts J. Hart. All but four of these initial members had been members of other Masonic Lodges prior to forming our Lodge and represented Lodges from all over the country, including Texas, Minnesota, California, and Ohio. 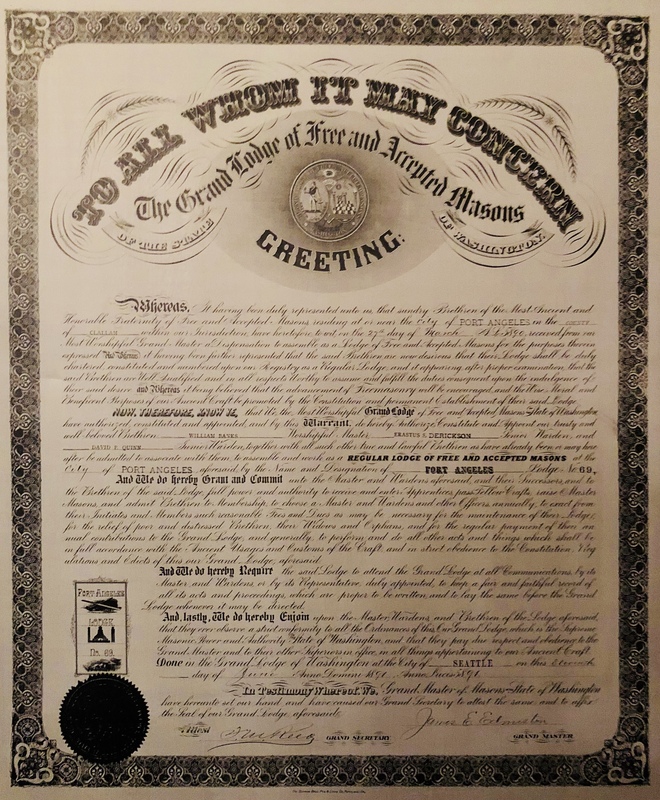 A photostatic copy of the original Lodge Charter – June 11, 1891. 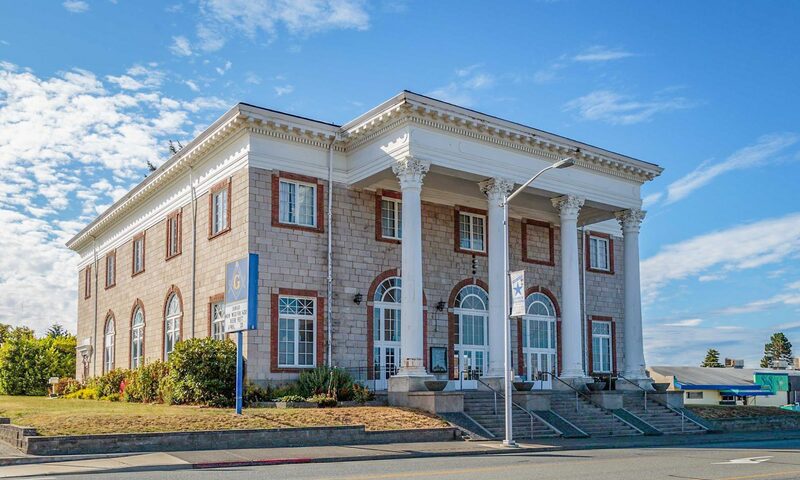 The Lodge first held meetings in the “Masonic Hall” at the Colony Building of the Puget Sound Co-operative Colony located at the corner of Front and Laurel Streets. In the first decades of the 20th century, the lodge met at various downtown locations, including the upstairs hall in the First National Bank building at 102 E. Front St. It wasn’t long before there was a need for another Masonic Lodge in the area, and the following members demitted from the Lodge in order to form Sequim Lodge No. 213 in 1915: Frank D. Babcock, Jens A. Bugge, Herbert Godfrey, Walter M. Graham, Frank Lotzgesell, Omar W. Noble, Clyde A. Rhodefer, Chas. F. Seal, and Lathan D. Stewart. Sixteen members later helped to organize and became Charter Members of Mt. Olympus Lodge No. 298 in Forks in 1954. In 1921, Seattle architect Earl Roberts designed a new temple to be located south of downtown at a site near the city’s other imposing landmarks—the courthouse, library and high school. Lodge members contributed much of the money and labor used in construction, and the facility was dedicated in November. When completed, the structure was clearly the most majestic fraternal hall in the city, and the size and style set a standard that would be followed (but not surpassed) later that decade in new halls built by the Elks, Moose, and other fraternal and civic groups. Throughout the early 20th century, Lodge members included some of the city’s most prominent citizens, and the prestige of the group was underscored by the role it played at important events in the life of the city. Masons, for example, officiated when cornerstones were laid for Roosevelt High School (1912), the Clallam County Courthouse (1914), and the United States Post Office (1932). For more on the Masonic ceremonies for the laying of the cornerstone of the Clallam County Courthouse, see the article titled “Court House Dedication” from the Port Angeles Olympic Leader, October 23, 1914. Freemasons of Port Angeles Lodge No. 69 (foreground, in aprons and collars) laying the cornerstone at Port Angeles High School, 1912. Photo courtesy of the BERT KELLOG COLLECTION OF THE NORTH OLYMPIC LIBRARY SYSTEM. Since the Lodge’s inception, the members enjoyed fraternal visits with the Brethren of Victoria-Columbia Lodge No. 1 A.F. & A.M., situated in the provincial capital of Victoria, British Columbia, Canada, on the opposite side of the Strait of Juan de Fuca. 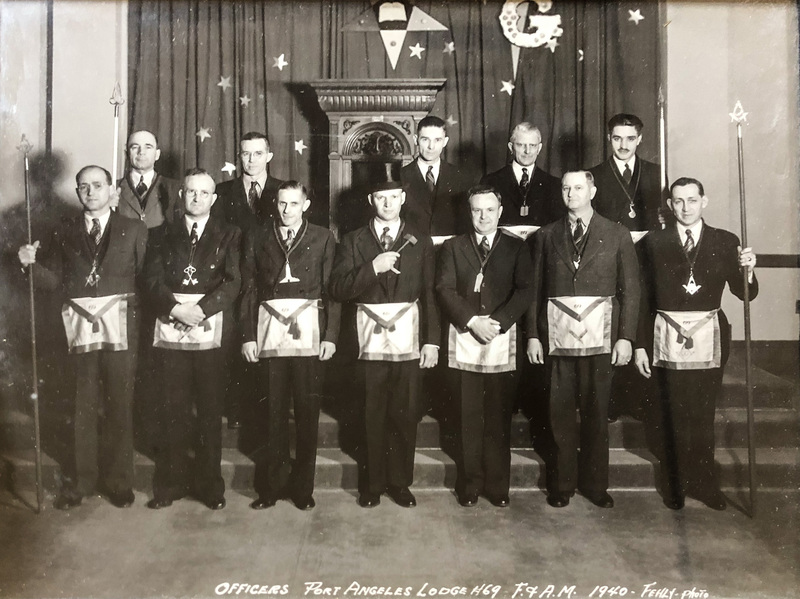 On September 21, 1925, a large contingent of officers and members of that Lodge made a formal visit to Port Angeles and established an ever-lasting bond as “Sister Lodges.” A tradition of annual visitations between the two Lodges continues to this day. The 1940 officers of our Lodge. Morris Earl Cays, Worshipful Master (center). The temple continued to serve as a site for various public events through the Depression era, and in 1941, after the bombing of Pearl Harbor, the hall was used for the temporary billeting of Company I, 174th Infantry Regiment of the New York State National Guard, which was rushed to Port Angeles to help defend the Olympic Peninsula against Japanese invasion. Not until 1958, with the construction of a new high school auditorium, did Port Angeles have a larger or more prominent meeting hall. The Freemasons of Port Angeles Lodge No. 69 have continued to be active contributors to and leaders of the communities of the northern Olympic Peninsula for more than 125 years.